I read this article and found it very interesting, thought it might be something for you. 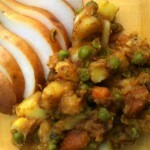 The article is called Indian-Spiced Parsnips, Peas, and Potatoes and is located at http://www.gardendish.com/indian-spiced-parsnips-peas-potatoes/. 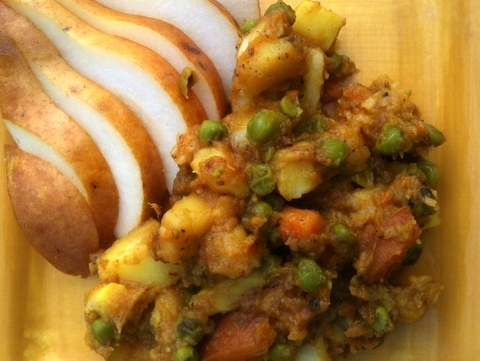 Indian-Spiced Parsnips, Peas, and Potatoes is a lightly-spiced mix of cold-weather favorites. The flavors are inspired by spices used frequently in Indian cuisine – turmeric and coriander. We’re often looking for more ways to include turmeric in our recipes. Science is uncovering a promising array of benefits from this beautiful, yellow spice, such as improved artery function, treating Alzheimer’s disease, and protecting our DNA. And there may be different benefits depending on whether you cook it or not. We recommend you learn to love it. Try changing up the veggie combination in this recipe. Try carrots instead of parsnips, or butternut squash instead of sweet potatoes. We’ve done that and it’s been tasty no matter the variation. The spices take center stage in this dish, but they’re not overwhelming, even if you’re not a heavy user of turmeric and coriander. If these spices are more common in your recipe repertoire, and you’d like a deeper flavor from the spices, then keep those spice jars handy, and adjust to your taste. In a large pot over medium heat, stir together the red pepper flakes, ground turmeric, and coriander powder for a few seconds, until the spices begin to smoke lightly, being careful not to burn them. Quickly add the water, parsnips, sweet potatoes, potatoes, and peas. Stir to coat the vegetables, cover, and cook for 25 minutes, until the veggies are tender and the mixture is thick. Stir in the lemon juice. Salt to taste. Nutrition (per serving): 268 calories, 91% calories from carbohydrates, 8% calories from protein, 1% calories from fat, 12g fiber.